Hello Again everyone. It's been awhile but I've been pretty busy so far this New Year. Thanks to all the blog traffic I got back in December , I've been selling a lot of paintings and taking commissions, also I've had a couple of offers to do shows. I hope this keeps up but its been putting a strain on my ability to produce more work. I guess I'll have just have to work harder, which I intend to do. So far this year we've had at least three major snow storms and there's nothing more I'd like to do than produce some great New England winter scenes . But you see, in order for me to paint I must have some sort of visual reference and that usually means that I have to paint on sight or work from photographs. My wife Jenn is the one who takes pictures for me, my disability prevents me from shooting my own. But she's been working full time lately, so we haven't been able to find the time to go out and shoot and if you think I'm going to go out and stand and paint in the freezing cold and snow your nuts! Its supposed to snow tomorrow and I'm hoping that we'll be able to go out this weekend. In the meantime, I'll have to settle for painting from the photos I have on file and because I don't have any winter scenes I'll have to dream about summer and paint from the warm confines of my heated garage studio. 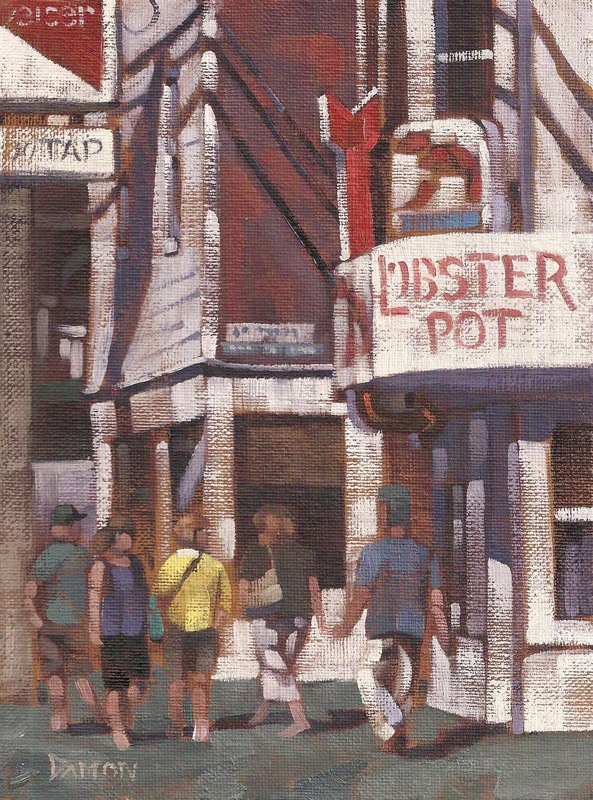 This particular scene was taken from a family visit to Provincetown , MA. , located at the very tip of Cape Cod. Its a picturesque little town by the sea, brimming with shops, art galleries, seafood restaraunts and well, ..... plenty of tourists. We stayed exactly three hours (the kids were very bored) , which is exactly how long it took to drive home.